GEORING Services is the initiator of a system for On-Orbit Servicing Named HERMES, aiming to kick-start the On-Orbit Servicing (OOS) industry in Europe. GEORING has invented and is pursuing deployment of a 5 element system to enable efficient deployment and delivery of a series of services on orbit. Some of these services apply to existing satellites but the full spectrum to the future satellites. 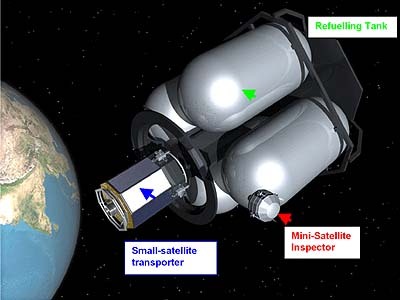 Core elements of the HERMES OOS system are 1) the HERMES tanker spacecraft which stores propellant, 2) the catcher-transporter spacecraft which performs missions from the tanker to the satellites and 3) the inspector spacecraft which performs inspection on targets as well as assists in docking operations. Additionally 4) a strap-on sub-spacecraft named Engine-Module (commercial name KINITRON�) has been designed to perform routine station keeping of old satellites and 5) a family of special Apogee Kick Motors has been defined to transport spacecraft in high thrust demanding misions. The HERMES OOS does not necessitate the deployment of all elements at day 0 but the full constellation would offer the maximum efficiency. The HERMES project (named so after the Greek god protector of messengers) is being developed by a team of companies that have authorized marketing of the concept by C. Kosmas, chief designer & inventor (patent DE10259638). The team is consisted by a group of European mainly companies .